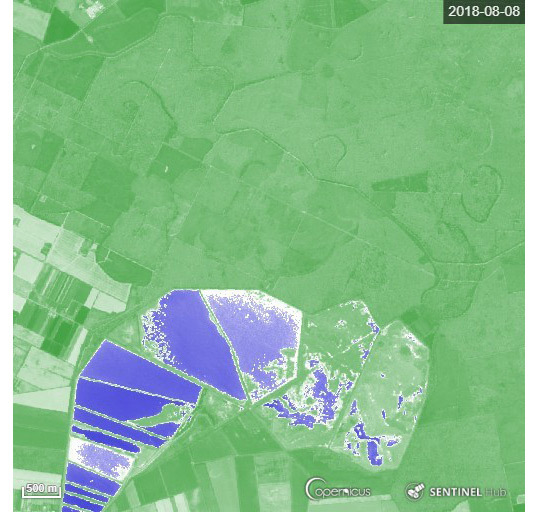 Baseline Satellite Data: Copernicus Sentinel-2A (2018) (acquired on 05/07/2018 & 04/08/2018, GSD 10.0 m) provided by the European Space Agency. False colour based on bands B8, B4, B3. 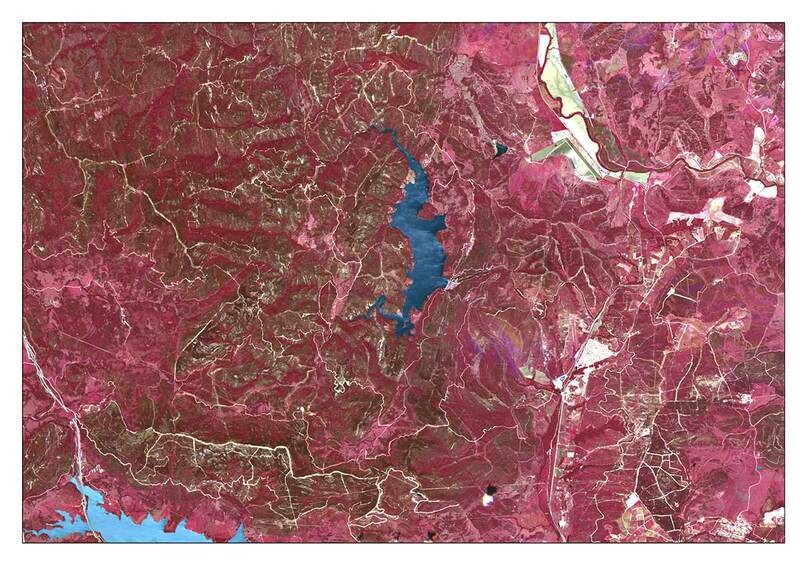 Product: Images show the wildfire effects in Mati, East Attica region, Greece. Fire broke out on the 23rd of July, 2018, burning 1275.9 ha. The fire caused 93 fatalities, 187 injuried and more than 1,000 buildings destroyed or damaged. 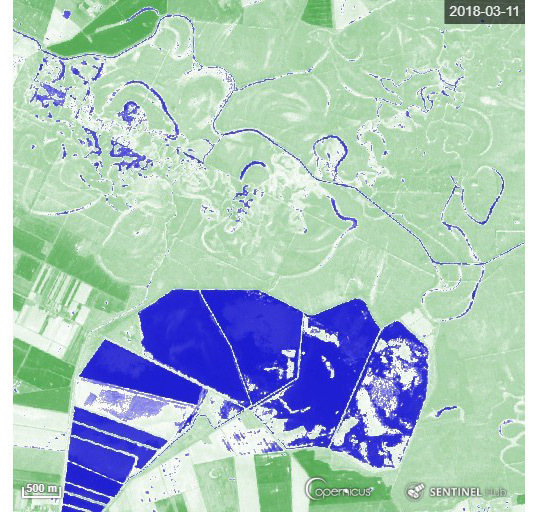 Baseline Satellite Data: Copernicus Sentinel-2A (2018) (acquired on 11/03/2018 & 08/08/2018, GSD 10.0 m) provided by the European Space Agency. SWIR based on bands B12, B8A, B4 and NDWI calculated with the following formula: (B3-B8)/(B3+B8). 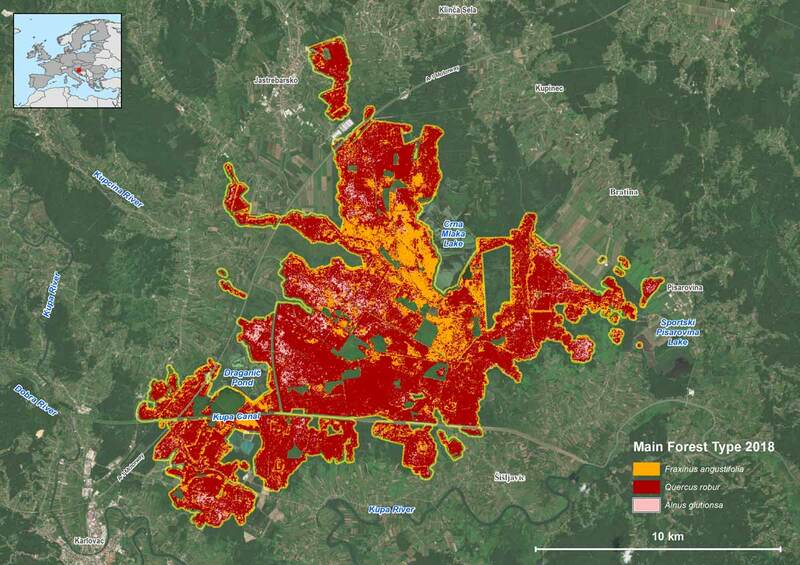 Product: Images show a flood prone area along the Drava river banks in Nasice Forest, in the Slavonia Region, house to centennial oak riparian forests. 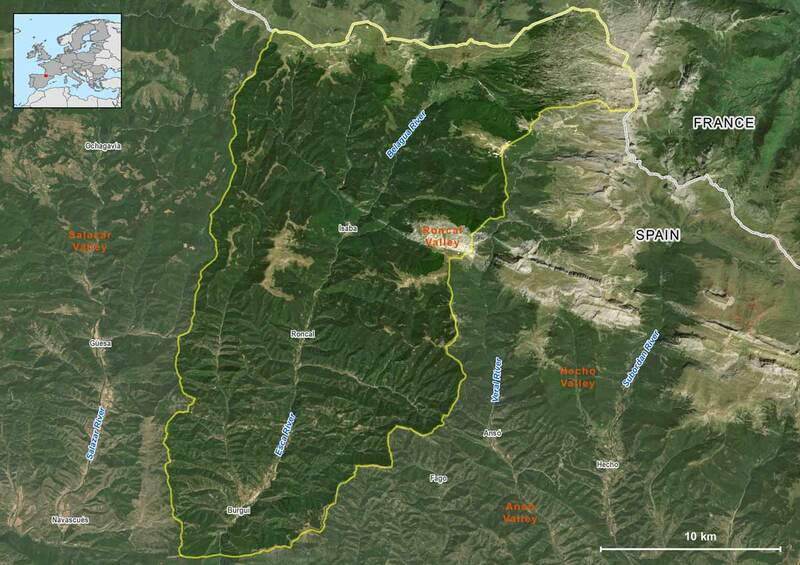 The health condition of these forest communities is determined by the water table depth and the hydrography network. Changes in the water table notably affect the growth rate of oak trees. Baseline Satellite Data: RapidEye © BlackBridge (acquired on 13/05/2011 GSD 5.0 m) False colour based on bands 4, 3, 2. Product: The area is located in Los Alcornocales Natural Park, in Andalussia, Southern Spain. The output product shows a forest/no forest mask obtained through supervised image classification. 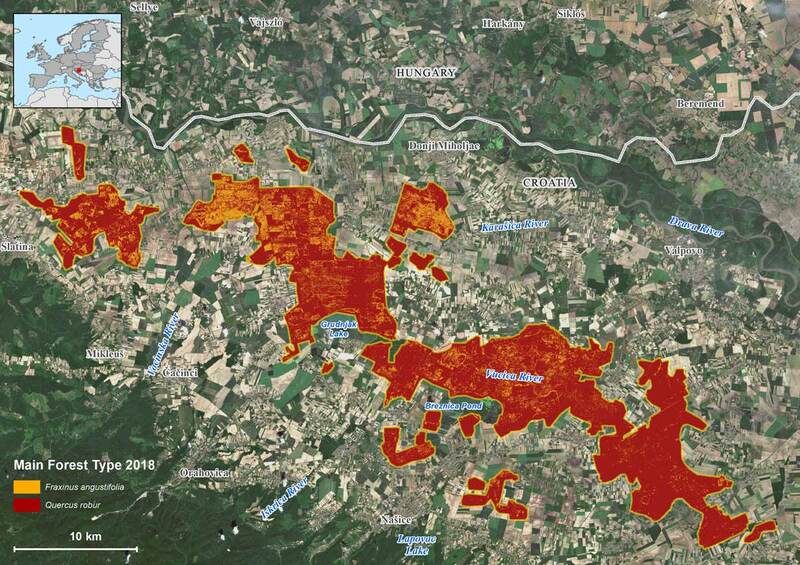 Baseline Satellite Data: Copernicus Sentinel-2A (2018) (acquired on 22/08/2017, GSD 10.0 m) provided by the European Space Agency. True colour based on bands B4, B3, B2. 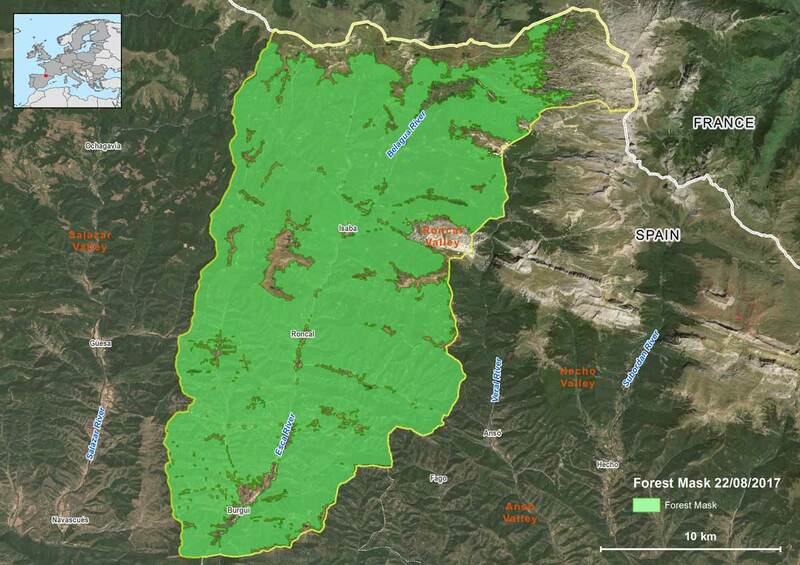 Product: The Forest Mask locates the forested area (34.345,00 ha) in the Roncal Valley of the Pyrenees. Automatic product by GMV; validated by FORESNA. 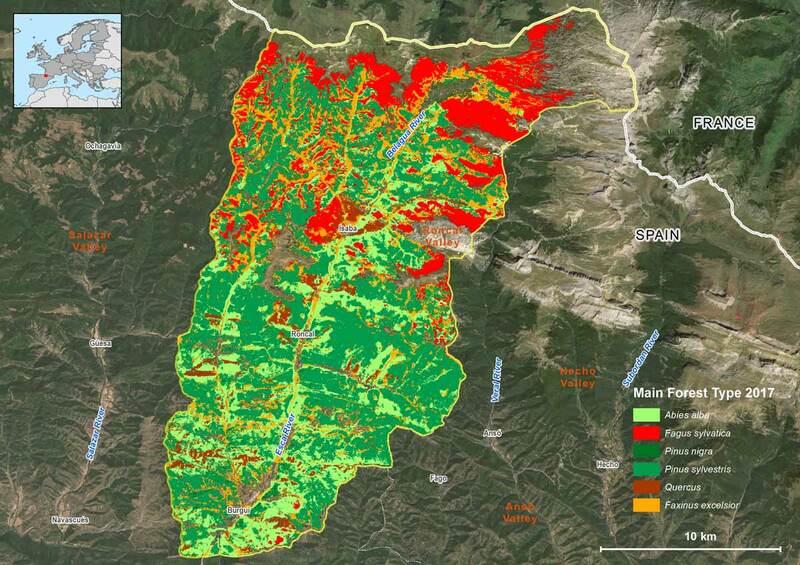 Product: The Main Forest Type shows distribution tree species area in Roncal Valley, these are 43,99% of scots pines (Pinus sylvestris); 19,42% of silver firs (Abies alba); 16,78% of ash (Faxinus excelsior); 14,89% of beeches (Fagus sylvatica); 4,25% of Quercus sp. ; and 0,66% of black pines (Pinus nigra). Automatic product by GMV; validated by FORESNA. 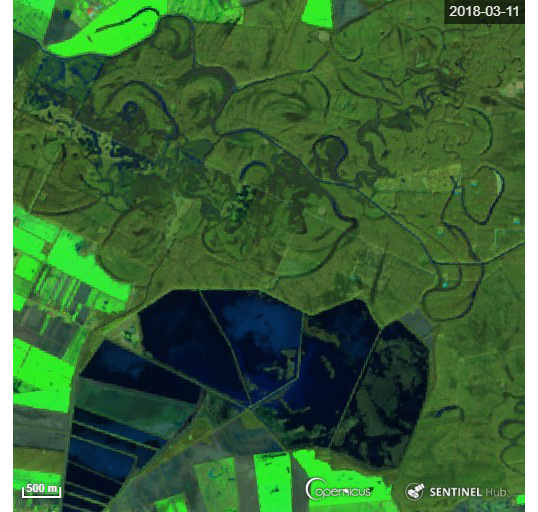 Baseline Satellite Data: Copernicus Sentinel-2A (2018) (acquired on 05/07/2018, GSD 10.0 m) provided by the European Space Agency. True colour based on bands B4, B3, B2. 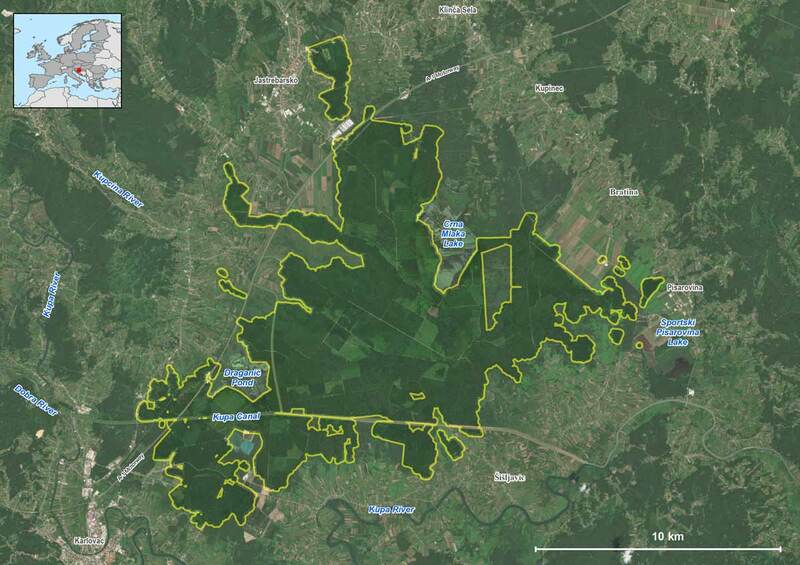 Product: The Forest Mask locates the forested area (11.977,13 ha) in the Pokupsko Basin, made up by the state-owned productive lowland hardwood forests. Automatic product by GMV; validated by CFRI. 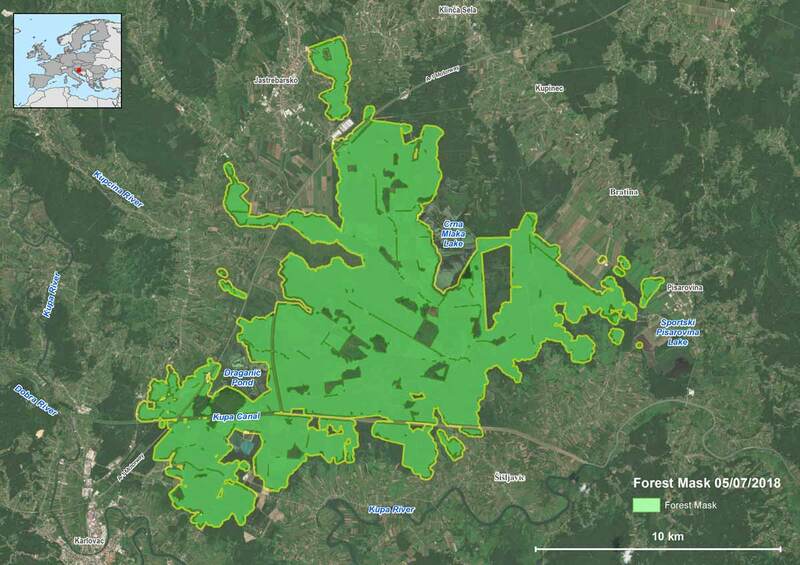 Product: The Main Forest Type shows distribution tree species area in Pokupsko Basin Forest, these are 71,56 % of European oaks (Quercus robur); 22,66% of narrow-leafed ashes (Fraxinus angustifolia); and 5,78% of alders (Alnus glutionsa). Automatic product by GMV; validated by CFRI. 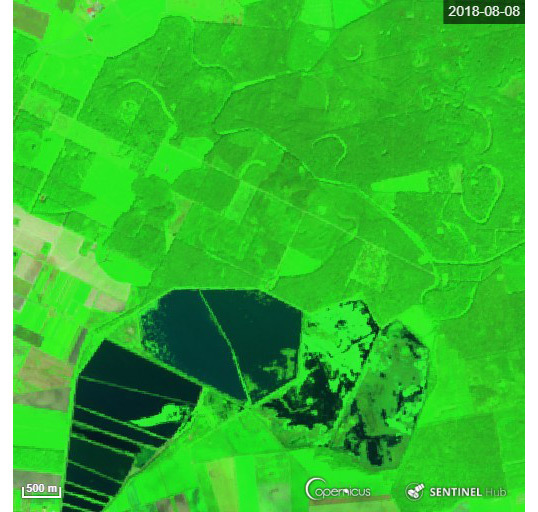 Baseline Satellite Data: Copernicus Sentinel-2A (2018) (acquired on 20/05/2018, GSD 10.0 m) provided by the European Space Agency. True colour based on bands B4, B3, B2. 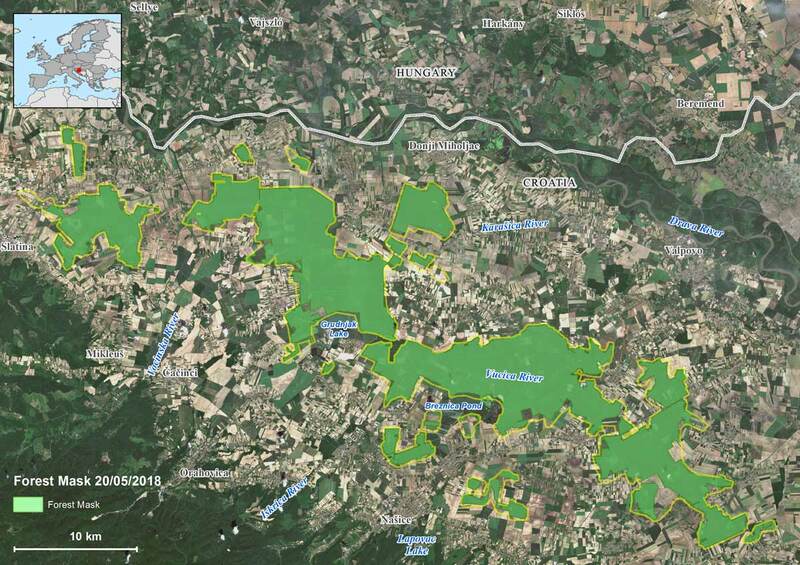 Product: The Forest Mask locates the forested area (30.604,26 ha) in the Nasice lowland forest in Drava Basin. Automatic product by GMV; validated by CFRI. 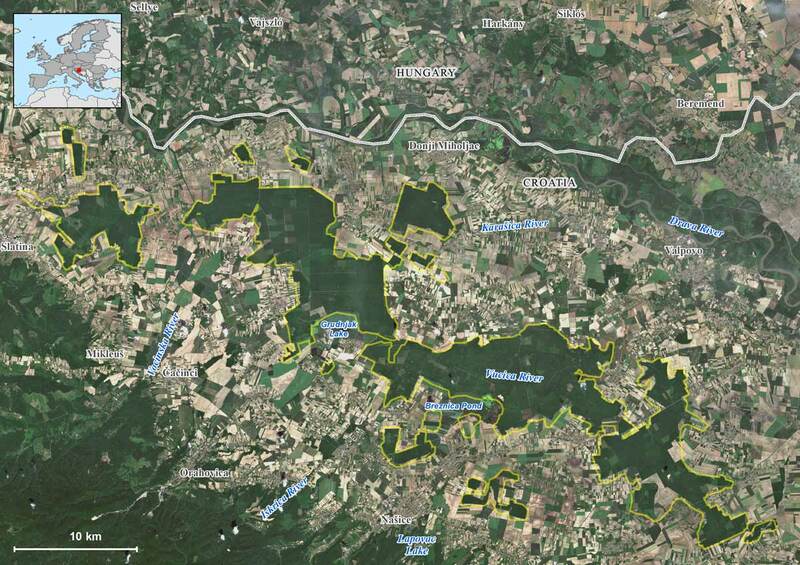 Product: The Main Forest Type shows distribution tree species area in Pokupsko Basin Forest, these are 86,06 % of Slavonian oaks (Quercus robur) and 13,94% of narrow-leafed ashes (Fraxinus angustifolia). Automatic product by GMV; validated by CFRI.